The Dyspneic Cat – Is it the Heart or Lower Airways? 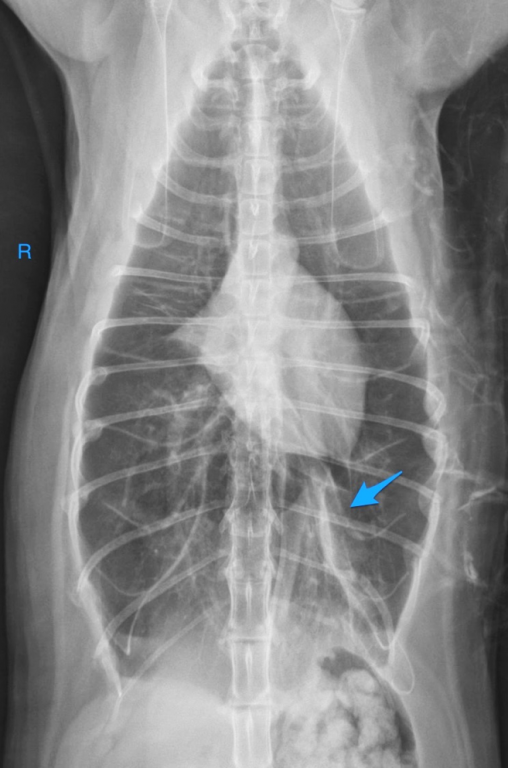 Almost daily, I encounter a radiographic study of a cat in respiratory distress and commonly, the etiology is either congestive heart failure (CHF) or chronic small airway disease such as asthma. Congestive heart failure has a predictable set of radiographic findings as described below and easier to discern from asthmatic cases. Asthmatic cases can be challenging to diagnose radiographically as many appear normal or have a questionable bronchial lung pattern even in the most severely blue-in-the-face asthmatic attack cases. How do I approach these radiographic cases? First and foremost, I look for key clinical history and physical exam findings before viewing the study. Reading these cases in a vacuum with no history is reserved for residency training torture and ill-advised. Now on to the radiographic assessment. Cardiomegaly (consider VHS > 8.2) has a low sensitivity at predicting a primary cardiomyopathy since many cardiomyopathies result in concentric hypertrophy (e.g. hypertrophic cardiomyopathy). Critically evaluate the left auricular region and left atrium on both orthogonal views for bulging as focal cardiac shape changes are as important in assessing for a cardiomyopathy. 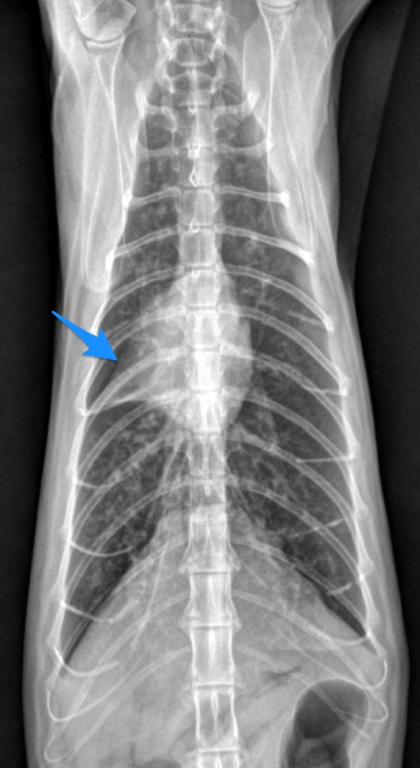 Remember, cats are not dogs, and this applies to manifestation of congestive heart failure radiographically. Cardiogenic edema – In the early stages, edema spreads in the peribronchovascular interstitium near the heart and appears as peribronchial cuffing or indistinct ring opacities. Peribronchial cuffing cannot be differentiated from small airway inflammation. As pulmonary edema progresses, look for increased hazy opacity in the accessory lobe region near the caudal vena cava and then progress to involve the ventral ½ of the lungs. 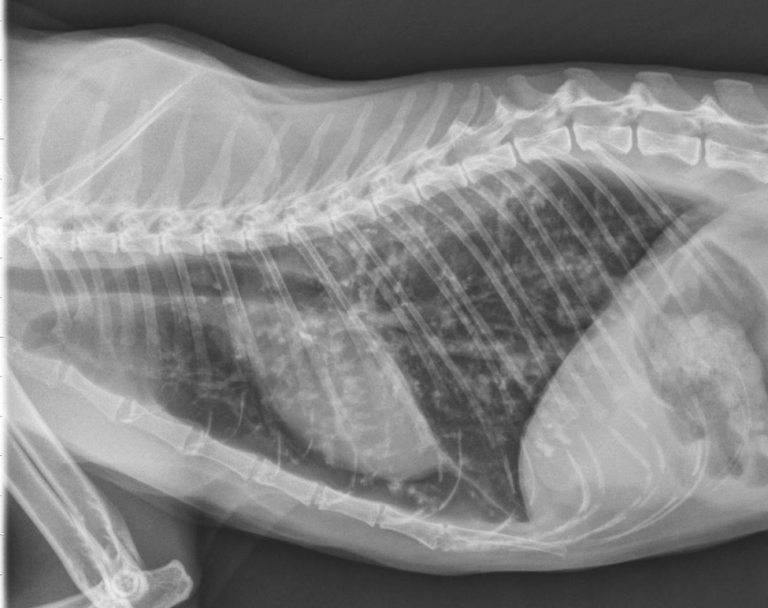 Contrast this to the typical perihilar/caudodorsal distribution of edema in dogs. If upper airway and pleural space disease have been excluded, asthma should be suspected in coughing or acutely dyspneic cats with a normal thoracic study or bronchial pulmonary pattern. Right middle lobar collapse (figure 1) – Anecdotally, this finding is often due to bronchial lumen plugging from small airway disease. Look for a small triangular opacity on the VD/DV view extending to the right of the heart and a faint lobar sign on the left lateral view in the expected region of the right middle lung lobe. Lung hyperinflation from air trapping at the small airway level can appear as hyperlucent and expanded lungs with flattening of the diaphragm on the lateral view. On the ventrodorsal view, tenting of the diaphragm can occur at the costal attachments due to the tension (figure 2). The diaphragm loses its smooth convex shape. Micronodular opacities can form due to small airway plugging by mucus and exudate or granuloma formation. Mineralized foci can surround the small airways or appear stippled in one or multiple regions of the lungs due to dystrophic mineralization from chronic inflammation or bronchial microlithiasis (figure 3). Figure 1: There is collapse of the right middle lung lobe creating a faint triangular alveolar pattern projecting to the right of the heart (blue arrow). Figure 2: The lungs are severely hyperinflated evidenced by bellowing of the chest wall and tenting of the diaphragm at the costal attachments (blue arrow). Also note the collapsed right middle lobe representing the small triangular opacity to the right of the heart and multifocal healed rib fractures likely due to previous respiratory distress. Figure 3: Numerous minuscule mineral foci are centered at the small airways. Also note the hyperinflated lung field with increased separation of the heart from the diaphragm.